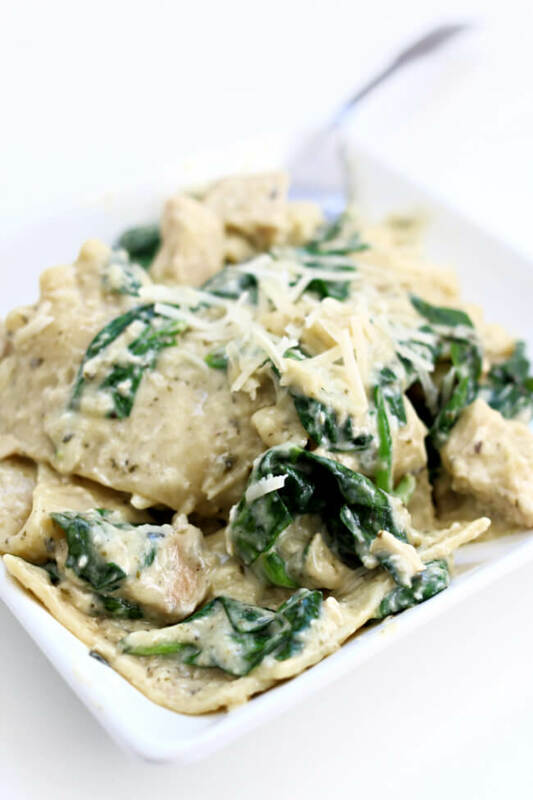 Instant Pot White Chicken Lasagna–a cheater, dump and go lasagna recipe with Alfredo sauce, lasagna noodles, chunks of chicken, spinach and Parmesan cheese. This recipe is made quickly in your electric pressure cooker. 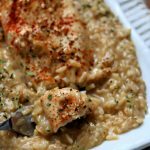 I saw a slow cooker version of this white chicken lasagna online and wanted to see how it would fare in the Instant Pot. I switched a few things around and it turned out beautifully. It’s more of an Alfredo pasta dish that uses lasagna noodles rather than a traditional type of lasagna that has the ricotta, mozzarella and layers. 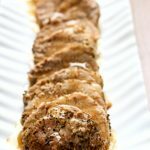 Everyone in my house loved it and I loved that it was really an easy dump and go type of meal! 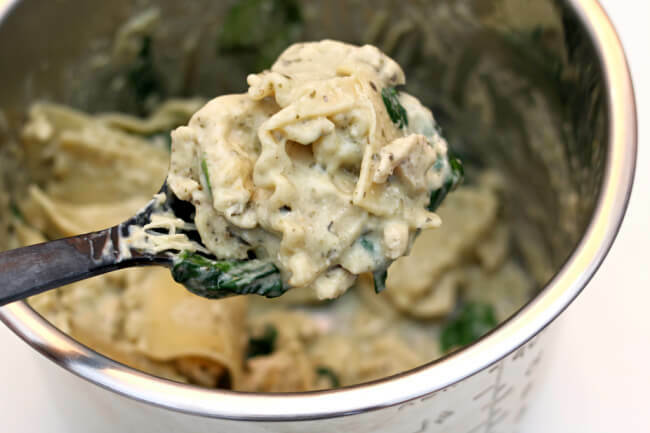 I used a jar of Bertolli Creamy Basil Alfredo…it caught my eye in the aisle at the grocery store. I think it added a little more flavor than a basic alfredo sauce. But really you can use whatever jar of sauce you want. To make Instant Pot White Chicken Lasagna I used my 6 quart Instant Pot Duo 60 7 in 1*. I love this Instant Pot because it has the yogurt making function which I use almost weekly. It has two pressure settings (high and low), and there are also little slots in the handles so that you can rest the lid there instead of putting it down on your counter-top. 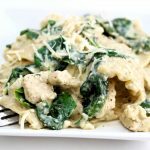 A cheater, dump and go lasagna recipe with Alfredo sauce, lasagna noodles, chunks of chicken, spinach and Parmesan cheese. This recipe is made quickly in your electric pressure cooker. Add ingredients: Add chicken, noodles, broth, salt, basil, pepper, garlic powder and onion powder to the Instant Pot. Give a quick stir. Try to cover the pasta as much as possible with the broth. Pour the Alfredo sauce evenly over the noodles. Pressure cook: Cover your Instant Pot and make sure the valve is set to sealing. Set the manual/pressure cook button to 4 minutes (for al dente pasta) or 5 minutes (for softer pasta). When the time is up let the pot sit there for 10 minutes (L0:10) and then move the valve to venting. Remove the lid. 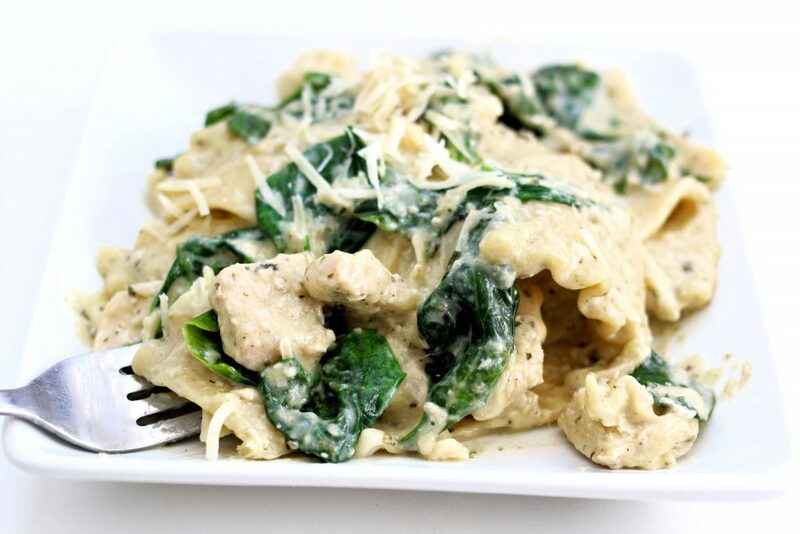 Add in cheese/spinach: Stir the pasta. Add in the Parmesan and the spinach. Stir until the spinach is wilted. Serve: Scoop the pasta onto plates and serve. I used my 6 quart Instant Pot Duo 60 7 in 1*. 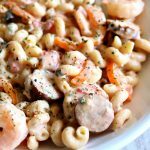 You can makes this in your 3 quart Instant Pot too. Halve all the ingredients and pressure cook for 5 minutes. If you have an 8 quart pot increase the chicken broth to 2 cups and pressure cook for just 4 minutes. 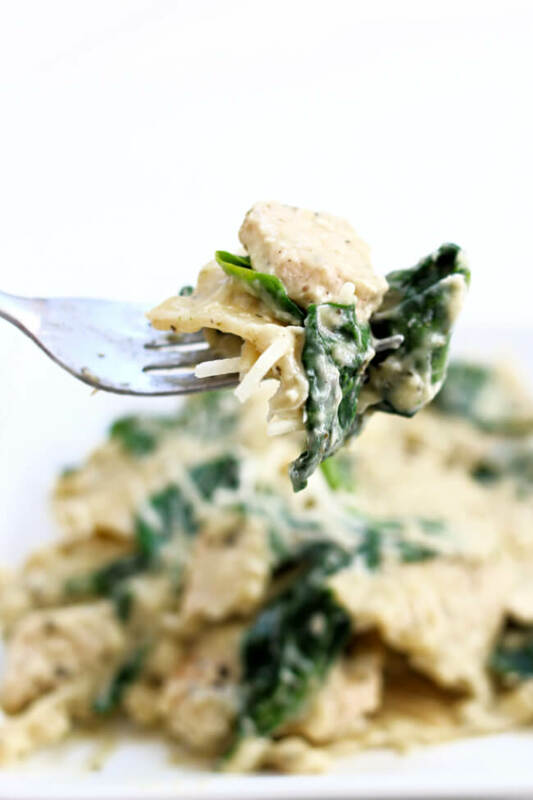 Like this recipe for Instant Pot White Chicken Lasagna? Get all my new recipes delivered to your email inbox by signing up below. If so, how would you adjust the time? Yes, keep the time the same. So happy to hear this Marisol! 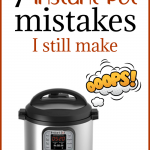 Do you have the instant pot on high? yes it’s always high pressure unless I otherwise note. hope you like it! we did! 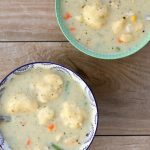 is there any health benefits of this food? 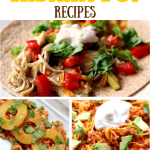 Can you use frozen chicken in this recipe and cut up or shred the chicken afterwards? If it’s whole chicken breasts they won’t cook at the same rate as the pasta. That’s why I have it cut into bite size pieces so that the pasta and chicken cook at the same rate. Are the lasagna noodles the “no boil” ones or regular? Does it matter? I used regular lasagna noodles. I bet if you used the no boil you would need less liquid and possibly less time.